My format's back to normal! Thank God. ._. "I ask you: What would you do if you were me? Tell me. Please tell me! But you're far from this. Your fingers turn the strangeness of these pages that somehow connect my life to yours. Your eyes are safe. The story is just another few hundred pages of your mind. For me, it's here. It's now. I have to go through with this, considering the cost at every turn. Nothing will be the same. I'll kill this man and also die myself, inside. I want to scream. I want to scream out, asking why. The scattered stars shower down like icicles tonight, but nothing soothes me. Nothing allows me to escape. The figure in front of me collapses, and I stand above him, waiting. I want to say that it has been a privilege and an honor to revisit Zusak's wonderful world of words once again since reading The Book Thief. I remember underestimating that piece of magic last year, and being blown away. So I knew not to make the same mistake with another of his books! I Am the Messenger is a completely unique book, completely different from any other book I've read in its own way. 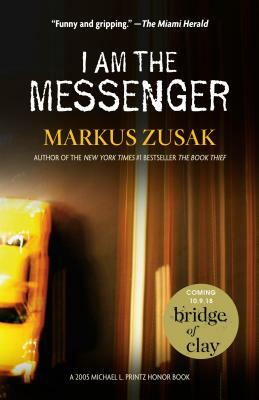 And I love Markus Zusak's work for that. Each character had a life far beyond the thoughts of Ed Kennedy, and it was ensured that you knew that. In 357 pages, you have learned about thirteen people. Even the smaller characters, such as Daryl and Keith, you learn so much about. Best friends, argue all the time, and only human. That is one of the greatest things in this book: despite Ed's duty to these people, you know he's only human. You learn something about every single person you meet through this entire work. The story is raw and well-conceived to all. Once again I've been breathless from his beautiful use of metaphors. The sympathetic but raw writing, the story of all the receivers of the messages. I think my favorite message was the one to Marv. That message almost put me into tears, and it probably would have if I hadn't been trying to finish the book before 3 in the morning. So much to say, so little words for it. I'll remember the messages to everyone for a long, long time to come. ...If I don't reread it as soon as I finish the other books on my reading list. There's not much need to put much else, I've put all that I feel I need to put. The book was amazing. The story, the characters, the messages, just...everything. Seriously. Markus Zusak, you have done it again.